Peter Lee claimed land as a volunteer settler in South Bend (along the river below Mount St. Joseph) on March 12, 1790, making his family among the first to live in Delhi. Although he sold this lot, he soon purchased 80 acres just west of there in what is now Sayler Park. His wife, Ruth (1765-1819), is the earliest burial in the Darby-Lee Cemetery. Lee was a veteran of the Revolutionary War. Cemetery Map, Courtesy of the Delhi Historical Society, all rights reserved. Henry Darby Monument. Photo courtesy of the Delhi Historical Society, all rights reserved. Darby House on River Road, photo courtesy of the Delhi Historical Society, all rights reserved. Henry Darby came to Delhi in 1818 and built a large stone house and then opened an inn on the River Road and was a friend of William Henry Harrison, America's ninth president. At one time he owned 300 acres, most of which now belong to the Sisters of Charity. Darby was rumored to have been involved with the Underground Railroad. He, his wife Margaret, and 4 of their children are buried in the cemetery. Their daughter Margaret Mayhew was the last known burial there in 1909. There is one non-family member buried in the family plot, that of Argyle Brackett (1858-1932). He lived in a house near the cemetery. His death certificate lists Mount St. Joseph as the cemetery. It is unclear why he is buried there. 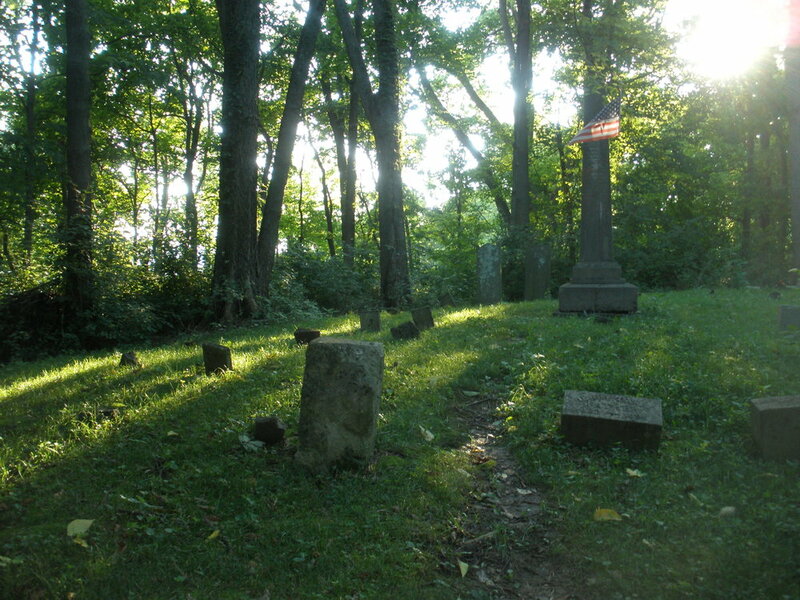 There is a legend surrounding the cemetery that the ghost of The Prophet - brother of Tecumseh - haunts the cemetery. The origin of this legend can be traced to a 1962 play written by WLW radio personality and Mount St. Joseph professor Cecil Hale Hartley. Mr. Hartley told members of the historical society before his death that it was a totally fictional play with no truth behind the story.